The deal with Iran has been explained and belittled in TCR for a long time. Now we have a deal after the U.S. final capitulations, and it's now up to Congress to stop this Munich type debacle. Even the liberal New York Times is skeptical. Especially remembering all the promises made by Obama that are now gone. David Sanger, in the New York Times, said, "Little in the deal... eliminates Iran's ability to become a threshold nuclear power eventually - it just delays the day." Can Iran keep enriching uranium? (a) Yes. (b) Yes. Will Iran still be able to make a bomb? (a) Yes. (b) No, if it doesn't cheat. Will inspectors have access to military facilities? (a) No. (b) Yes, with a permit. When will the sanctions be lifted? (a) They are gone now. (b) Soon. How can the U.S. be sure that Iran won't cheat? (a & b) We cannot. How long will the deal last? (a) Until Iran is caught. (b) Likely after 10-15 years of possible cheating. Iran reduces by about half the number of centrifuges actively enriching uranium. Iran reduces its stockpile of enriched uranium from about five tons to 300 kilograms. Iran repurposes its heavy water reactor in Arak so it does not produce plutonium. An unspecified increase in inspections by the IAEA." Almost every type of U.S., EU, and UN sanctions lifted. 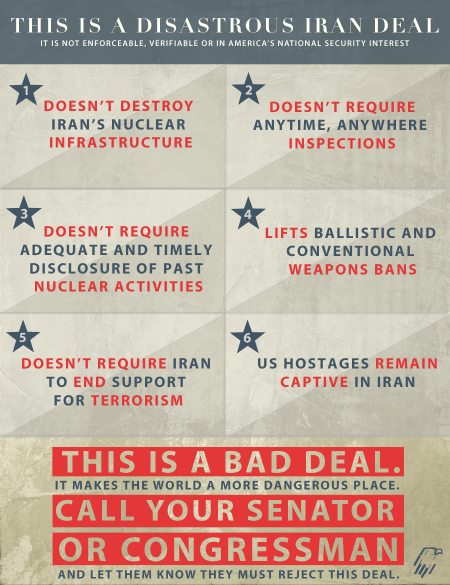 Repeal of six UN Security Council resolutions declaring the Iranian nuclear program illegal. Top IRGC and Quds Force terrorists removed from the sanctions list, including Qassem Suleimani, leader of Iran's campaign against U.S. soldiers in Irag, and Ahmad Vahidi, mastermind of the 1994 Jewish community center bombing in Argentina that killed 85 people. The removal from the sanctions list of approximately 800 people and legal entities, including 23 out of 24 Iranian banks. $100 to $150 billion to be unfrozen and given to Iran with no restrictions on its use to purchase arms and fund terrorism, including funding for Hezbollah, Hamas, and the Assad regime in Syria. Iran keeps every one of its nuclear centrifuges. Iran keeps its entire physical nuclear infrastructure, including the enrichment facilities at Fordow and Natanz and the nuclear reactor at Bushehr. Iran permitted to continue research and development on all of its advanced centrifuge designs, reducing nuclear breakout time at the end of the deal to weeks. Iran permitted to transition its allowed enrichment of uranium from older centrifuge designs to advanced designs. No "anywhere, anytime" inspections. Iran can delay inspection of any site for at least 24 days. No requirement that Iran fully disclose past nuclear weapons research and development (known as the PMD issue). The P5+1 western powers pledge to collaborate with Iran on nuclear technology. Restrictions on enrichment - part of the "sunset" of the deal - are lifted after eight years. If Iran is thought to have violated the deal, in order to "snap back" sanctions a dispute resolution process must be undertaken that can last two and a half months, after which the matter can be referred to the UN Security Council. At the UNSC, the re-imposition of sanctions can be vetoed by Russia, which stands to earn billions of dollars from arms sales to non-sanctioned Iran. Ballistic missile embargo lifted after eight years. Conventional arms embargo lifted after five years. "A deal originally conceived as trading sanctions relief for an end to Iran's nuclear program evolved into a deal trading sanctions relief for time-limited restrictions on Iran's ambitious nuclear plans." "According to the agreement, there is only one penalty for any infraction, big or small - taking Iran to the UN Security Council for the "snapback" of grandfathered in and immune from sanctions. That means one can expect a stampede of contracts - some real, many hypothetical - all designed to shield Iran from the impact of possible re-imposition of sanctions, thereby weakening the impact of the punishment. "But the problem with snapback gets worse. The agreement states that Iran considers a re-imposition of sanctions as freeing it from all commitments and restrictions under the deal. In other words, the violation would have to be really big for the Security Council to blow up the agreement. That effectively gives Iran a free pass on all manner of small to mid-level violations." Hopefully, Congress will vote the deal down, but even if they do, Obama, in so many words, is already saying if the UN backs it then what Congress does won't matter. If you followed the news coverage of the last session of the Texas Legislature, you probably got the impression that there was a great deal of controversy between the Rs & and the Ds. This was true to a point. On hot button issues like abortion or gun rights, there was dissension, disagreement and controversy. That is to be expected. However, the news media notwithstanding, except for these hot button issues, the rule in the Texas Legislature this past session was "Go along to get along." No one rocked the boat and no one made waves. Actually, cooperation was the rule of the day. For example, early in the session I came across an absolutely awful bill introduced by a very liberal Democrat in the House. I was amazed when I learned that an ostensibly conservative Republican in the Senate introduced a companion bill in the Senate. The House bill went nowhere. But the Senate bill became law and is about to cause of a good deal of mischief. When several other bad bills were mentioned to Republican lawmakers, they refused to take the necessary steps to kill the bills out of fear of retaliation. That is sad and disillusioning. Mercifully, not everyone in the Texas Legislature was that way. Rookie Senator Paul Bettencourt, unlike his colleagues, was willing to actually fight against bad bills. Good job! May your tribe increase! Judge Rory R. Olsen is the presiding judge of Harris County (Texas) Probate Court at Law No. 3. Recently we had a rendezvous with my daughter's future roommate (plus her mother and her mother's best friend). The roommate is moving to Los Angeles from New Jersey after graduating from college. When we met the mother and her friend, they were both prominently wearing crosses on necklaces. We felt much more comfortable about the future of our child's new living arrangement. They were delighted to find out we were committed Jews. I spend extensive time discussing with people who adhere to different denominations of Christianity. I am still befuddled by the varieties of Protestantism and I am confident I will never get it down as hard as I try. I rarely, if ever, criticize someone adhering peacefully to their religion. At this juncture I feel compelled to criticize this Pope (Francis) because he has crossed over into my area � public policy � more than sticking to healing the faithful of his religion. That is not unfamiliar territory for Jewish Republicans. We experience this often from rabbis, due to the fact the vast majority of rabbis are people of the Left. They feel compelled to express their left-leaning beliefs from the pulpit, while Republicans often cringe at High Holiday services as we endure an onslaught of leftist mantra in lieu of a lesson about the Torah. As important as that is to us, it pales in comparison to the magnitude of the comments from our current Pope. There is no doubt that Pope Francis came to his defined point of view after being shaped by his life experience in Argentina with its deeply-confused political structure. One might think that he would reject left-wing politics, having experiencing firsthand the failure of Argentina's socialist-leaning governments. Instead he appears to have Paul Krugman, the befuddling economist and columnist for the New York Times, as his guiding light. Francis like Krugman seems to think that every failure of invasive government and restriction of capitalism is an excuse to double down with the mantra that the problem is government has not gone far enough. First, Pope Francis issued an encyclical regarding climate change. I must stop here and cite that anyone who uses the terminology "climate change" is just downright silly. No one in their right mind does not understand that the climate is fully in flux at all times. The significant changes in the environment are not only outside our control, but beyond the scope of worldly endeavors as matters in our solar system and beyond, have grave effects on our climate and its ever evolution. I am more an adherent of George Carlin (certainly no conservative) who can be seen here (https://www.youtube.com/watch?v=BB0aFPXr4n4). I also have interviewed multiple real climatologists who question the models used to calculate these 'severe' weather changes either because of their inability to replicate the models or the fact that the models have been so divergent from actual experience. But the bigger problem I have with Pope Francis generates from his comments on economic policy. You may know the Pope recently went to South America. Other than doing normal Popely duties he delivered a dissertation on economics. He chose to deliver these comments in Bolivia, which as a country is following in the footsteps of Venezuela. Bolivia is ranked as the 163rd freest country in the world out of 178 countries on the list. The President, Evo Morales, has been in office since 2005 and has no plans for retiring. Bolivia is rich in natural resources and oil, but has produced South America's poorest economy with average daily earnings of $2. Morales has expropriated more than 20 companies. The Pope railed against a system that "imposed the mentality at any price, with no concern for social exclusion or the destruction of nature." That is a turning of a phrase that any Marxist would be proud to have stated. This speech followed comments from President Morales wearing a jacket from his mass-murdered collection which was adorned with a picture of Che Guevara. The Pope even invoked the true enemy in describing capitalism when he quoted a 4th century bishop by saying it was the "dung of the devil." Wow, what would he call the mass murdering societies of National Socialism and Communism? Certainly, capitalists do bad things, but to be so ignorant as to not understand that more people have advanced through democratic capitalism to a quality and healthy life than through any other form of government just reeks of prejudice and denial. This Pope does not understand how wealth is created. That very wealth feeds his church and keeps it solvent. He also does not seem to understand that capitalism breeds believers in the fruit of the divine. Does he really believe that the alternatives are not aimed at destroying the church? In effect he is expediting his own church's execution. Yes there are religious people who abuse capitalism, but more often than not the ones who adhere to capitalism's true betterment of mankind our religious souls and the non-believers are the abusers. On a trip to Thailand, we had to buy a suitcase to bring home all the inexpensive clothing we bought. But I focused on how great it was for the Thais that they had quality shoes and shirts and pants at affordable prices as part of producing lower-priced products for us. Capitalism has moved in the past 30 years a few hundred million peasants in China and India from uneducated, barely-existing lives to a hope for the future where they are clothed and housed and educated. That is us capitalists, Pope Francis, not Che and Evo's socialist friends in Cuba and Bolivia. Sorry, sir, but you placed the devil on the wrong team. You may need to go back and study up on Pope John Paul II. Bruce Bialosky is the founder of the Republican Jewish Coalition of California and a former Presidential appointee. You can contact Bruce at bruce@bialosky.biz. Red, White & Blue featuring TCR Editor Gary Polland, liberal commentator David Jones and moderator Linda Lorelle on Fridays at 7:30 pm on PBS Houston Channel 8.1, replaying Saturdays at 6:30 p.m. on Channel 8.1, Mondays at 11:30 pm on Channel 8.2 and on the web at www.houstonpublicmedia.org. 07-24-15 - Author Bret Stephens, America in Retreat: The New Isolationism and the Coming Global Disorder. 07-31-15 - State of the City with Houston Mayor Annise Parker. Gary Polland is a long-time conservative and Republican spokesman, fund-raiser, and leader who completed three terms as the Harris County Republican Chairman. During his three terms, Gary was described as the most successful county Chairman in America by Human Events - The National Conservative Weekly. He is in his sixteenth year of editing a newsletter dealing with key conservative and Republican issues. The last fourteen years he has edited Texas Conservative Review. As a public service for the last 12 years, Gary has published election guides for the GOP primary, general elections and city elections, all with the purpose of assisting conservative candidates. Gary is also in his 13th year of co-hosting Red, White and Blue on PBS Houston, longest running political talk show in Texas history. Gary is a practicing attorney and strategic consultant. He can be reached at (713) 621-6335.